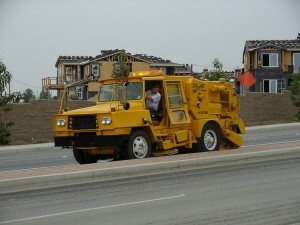 Developers, Home Builders, Grading Contractors, Landscapers and Concrete Contractors all need a sweeper they can depend on. There are enough headaches to steal your valuable time. At Bill’s Sweeping we use the best technology available for your particular job. Our mechanics are experts in keeping these machines operating and in top condition. We wrap our own brooms to provide a heavier broom and to ensure consistency and quality of the broom.Our drivers are uniformed, drug tested and receive the most extensive training in the industry.We follow that up with weekly safety & operational training, including written tests. Have a long term project? Discount rates are available for high volume work, quick payments, and flexibility in scheduling. Give us a call at (714) 637-3180 to discuss your specific needs.